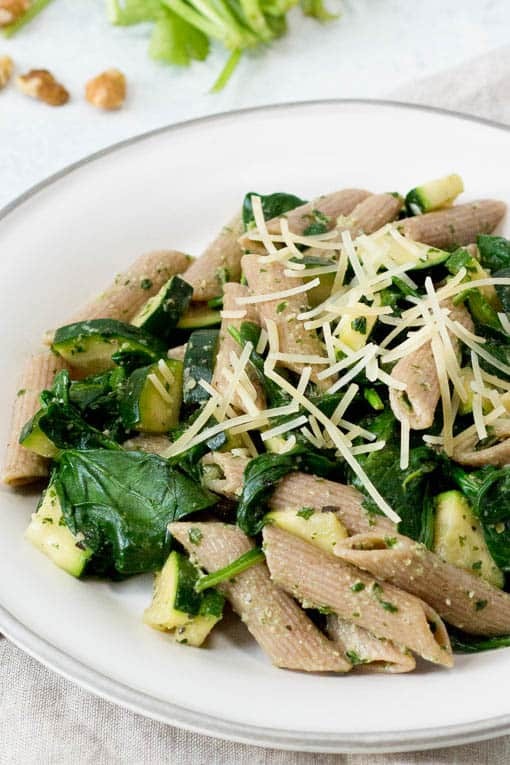 Pesto and pasta is one of those classic combinations that everyone loves. It’s just so satisfying — something about that combination of fresh herbs, olive oil and nuts is so comforting! I don’t make traditional pesto very often because while it’s super delicious, it’s also not great for maintaining a healthy weight (since you can have too much of even good, healthy fats!) But I recently came across a pesto recipe from Cooking Light, and modified it to make it even healthier by adding more veggies! 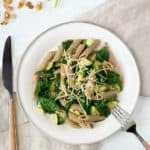 Here is my version of a healthy pesto recipe: Whole Wheat Penne with Walnut Sage Pesto – perfect for a weeknight dinner since it can be ready in under 30 minutes! 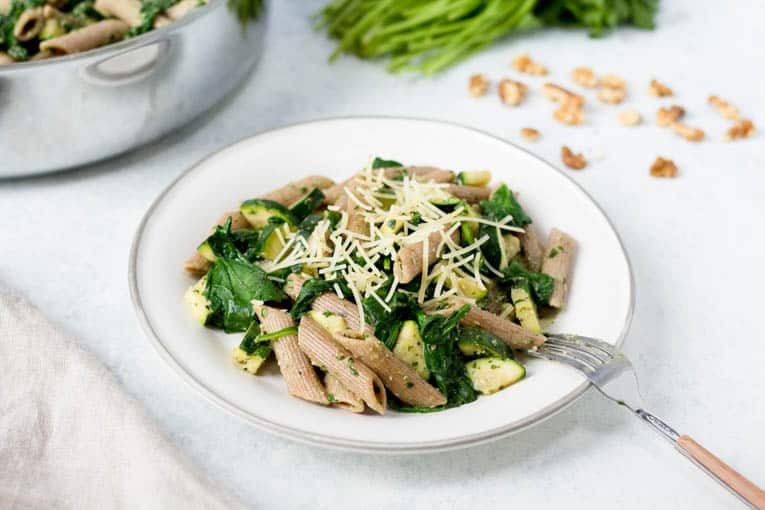 In this recipe I added some fresh veggies – figured I’d stick to the green pesto theme and bring in zucchini and baby spinach – both of which are rich in fiber and antioxidants. 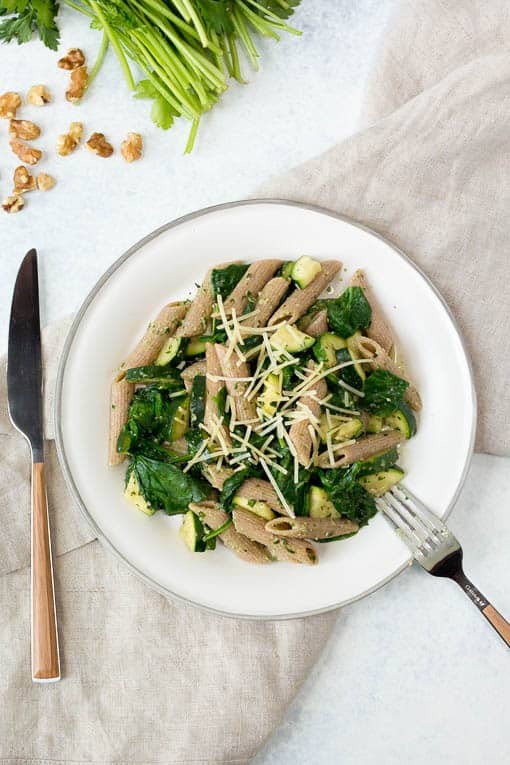 So what else makes this pesto pasta recipe healthier than most? 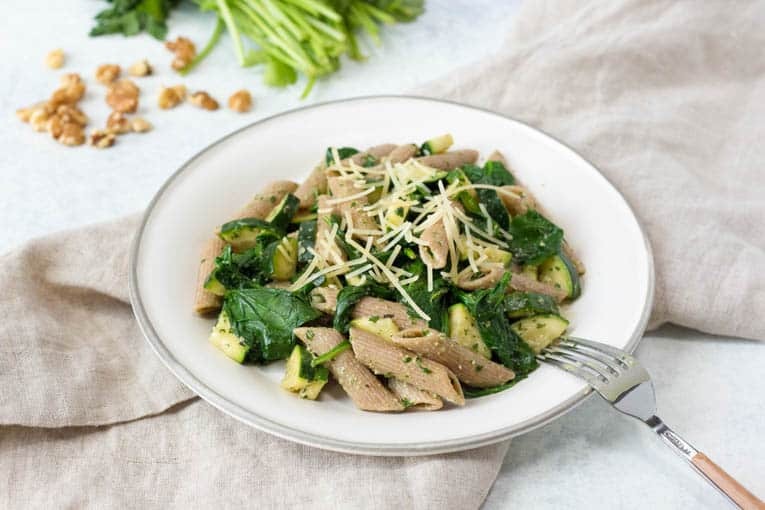 Less olive oil and nuts (but enough to make it luscious), more fresh herbs, more veggies, and whole wheat penne instead of white pasta! 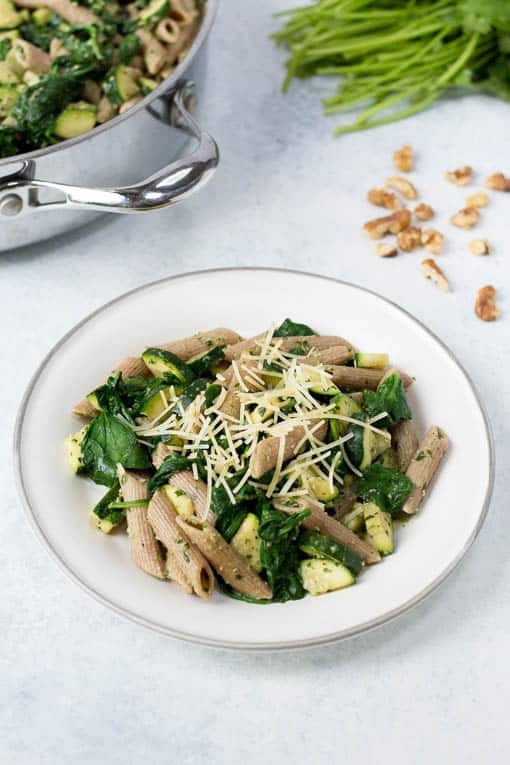 You can also try this with chickpea pasta (I love this one from Barilla) which I’m pretty sure will be equally good but will be much higher in protein, and chickpea pasta would make it gluten free as well – added bonus! A big colander that’s dishwasher safe. I like this one from LiveFresh. It’s stainless steel, durable and dishwasher safe which makes for easy cleanup! This recipe is super kid friendly, and does freeze pretty well – you’d just have to defrost it in the oven or microwave (on the defrost setting) before eating it. For serving – you can serve this with some whole grain garlic bread on the side, or even a side salad if you want even MORE veggies on your plate 🙂 Yum! Cook penne according to package directions, cool and set aside. Spray a pan with cooking spray, heat over medium heat. Add zucchini and 2 cloves minced garlic and stir fry lightly (for about 5 min max). Add spinach, garlic salt and oregano and cook through until spinach is wilted. Set aside. Combine 1/4 teaspoon salt, parsley, and next 5 ingredients (through 1 clove garlic) in a food processor; process until finely chopped, scraping sides. With processor on, slowly pour broth through food chute, processing until well blended. Combine penne and pesto in a pot on low heat until combined and heated through. Add pepper and mix well. Add in vegetables and serve warm, top with 1 Tbsp Parmesan cheese per serving. Looks, delicious! My boys love pasta, and I’ve been looking for some new recipes to mix things up! Awww thanks Alison! 🙂 Hope you and your boys love this recipe!! This looks so yumm!! It’s tasty as well as healthy! I love this combination! 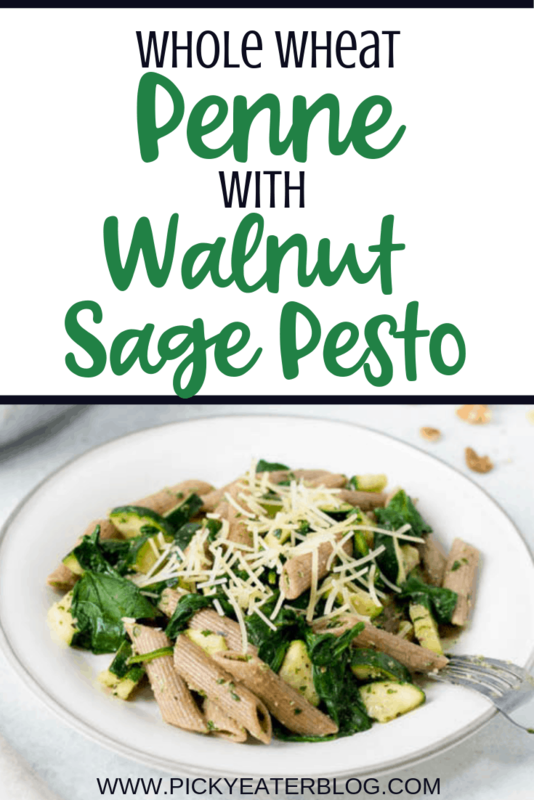 Love the twist in using walnuts in pesto! I love to try different pesto recipes. This one sounds fantastic. I love walnuts — and it’s so nice when something I love eating is a healthy, too. This looks really good. This is absolutely scrumptious. I do love walnuts in pesto and different herbs. The additions of the scrumptious vegetables make this heavenly.